I am loving my version of the Lady of the Lake quilt, a new pattern by Fat Quarter Shop from their Classic and Vintage Series. I made mine into a wall hanging measuring 34" x 50-1/2", perfect for an empty corner in my house. This has been a fun Sew Along! I used fabrics by Marcus Brothers from their New London line (which I have had for quite a while) for the blocks, and a gray by Cloud9 for the background. The pattern, even though is from their Classic and Vintage collection, works very well with modern fabrics, too. The two middle blocks were last minute additions - I wanted to include different blocks for a new look. 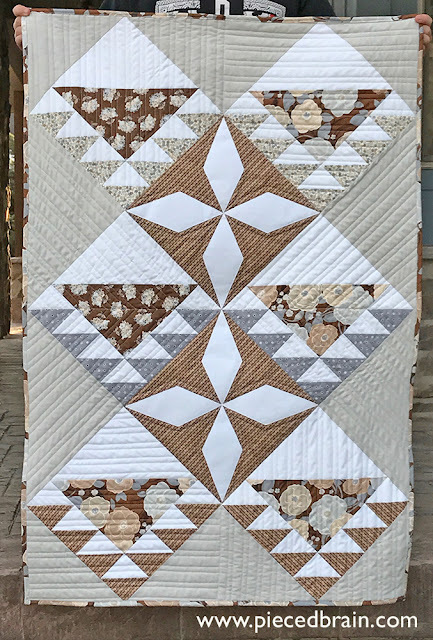 This project was pieced with Aurifil 50 wt. 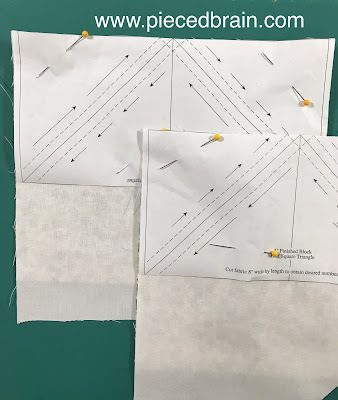 thread and quilted with white thread using my Bernina's walking foot. 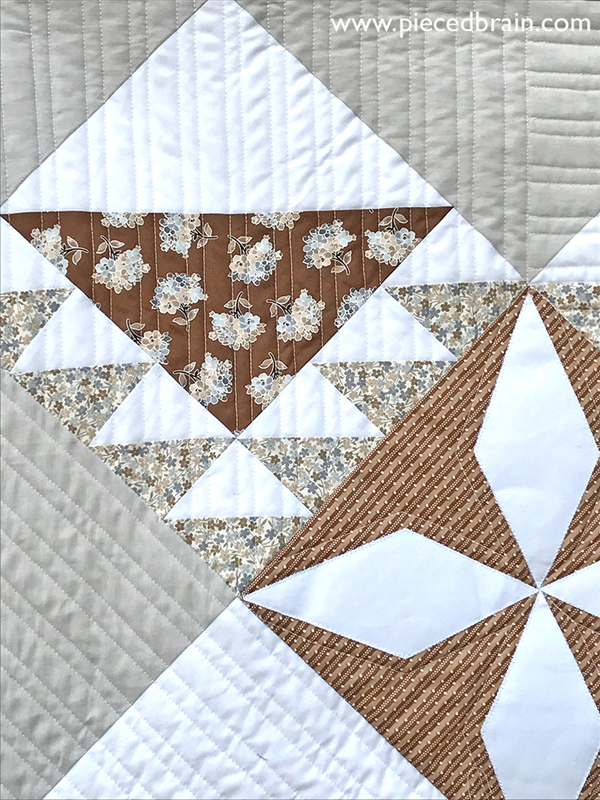 I opted for alternating the width of the lines to add a fun texture, and changing the direction of the quilted lines depending on the area of the quilt. I like it! 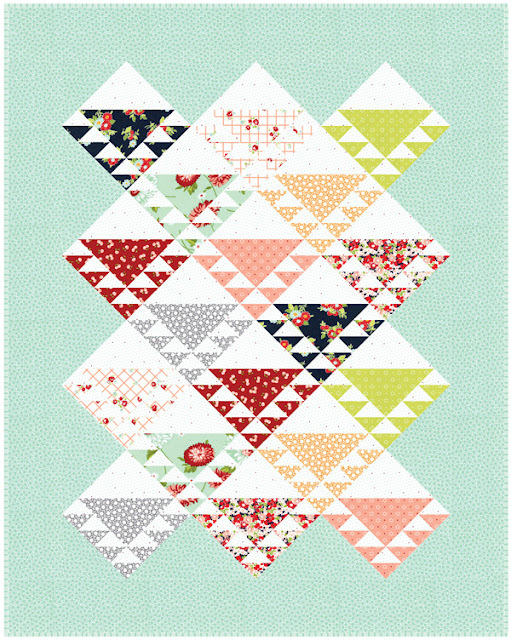 The small half square triangles for each block were made using the 3" Half Square Triangle Paper Triangles on a Roll paper. This method is fantastic - just select as many of the squares as you need (I chose two because I was using up scraps at this point), pin to fabrics, and stitch on the dotted lines. Then, cut on the straight lines and peel paper. Fat Quarter Shop has a video tutorial on Youtube so check it out. I would love to make a large version of this quilt since the blocks come together so easily, and are so beautiful. What do you think? I am heading over to their blog to see the projects the other bloggers made. Come with me! I really like this quilt, Denise! Those center blocks add a nice pop! What is the name of that block? I would love to know how it is constructed but don't see it in your patterns or tutorials. Thanks so much for sharing your work so generously! Gloria, give a little while and I will post a tutorial. I am out of the country right now... Thanks for stopping by! You did a beautiful job using your interpretation. I like the original also, but I really like your color palette and layout.